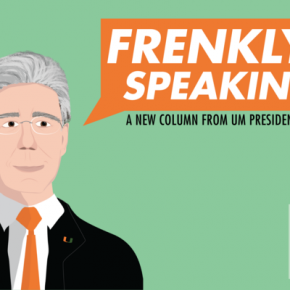 After flocking to tables of food at the Rock Wednesday, University of Miami staff, faculty and students took their seats to listen to their peers deliver the State of the U address. Contrary to past years’ tradition, Student Government (SG) President Nawara Alawa insisted on diversifying this year’s event. “Our team decided to spice things up a bit … we are inspired by you,” Alawa said in her opening statement. She then discussed the progress of the different SG agencies, citing accomplishments such as Cat 5’s efforts to raise support for Miami sports teams, which increased attendance at football games by 20 percent. For the near future, Alawa spoke about the modified academic calendar, SG-sponsored competitions and programs like an “Iron Chef” program and UFactor. She also mentioned SG’s recent collaboration with student governments across the nation, who will be lobbying Congress to keep student interest rates low. “Make sure that you’re as interested and involved in a lot of the things going on, supporting other students in their endeavors,” Alawa said in closing. Many of the students in attendance, like senior Jonathan Bulgini, appreciated the new inclusive format of the event. Senior Mariah Forde agreed, even though she had only come to the event because one of her sorority sisters was speaking on behalf of United Black Students. After Alawa thanked all in attendance, she invited a range of 16 different student leaders to bring the audience up to date on their recent accomplishments and future plans. 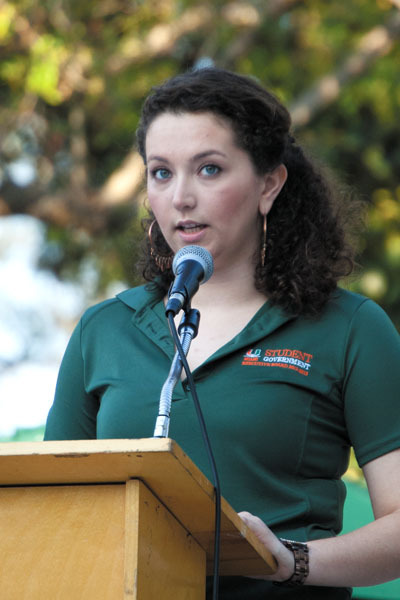 UM’s center for service and leadership was represented by its public relations coordinator, junior Mike Piacentino. “Together we can learn from each other, we can learn with each other, and most importantly we can learn about each other,” he said while starting the speech. Piacentino then went on to mention new additions to the Butler Center, like the Women’s Leadership symposium, as well as upcoming celebrations, such as the 30th anniversary of FunDay. From across the lake, third-year Residential Assistant Jacob Sperber and first-year Academic Fellow Victoria Sadowski presented updates on the activities of almost half of the university’s freshmen. This past fall, SRC strived to establish a well-founded community by hosting events exploring the community and interacting with UM staff. For the upcoming semester, SRC plans to further this goal by hosting events, like a fashion show, to educate residents on how to better their careers. President Justin Borroto gave a thankful welcoming before discussing FEC’s “Not Cuban, who cares?” event and the group’s consequential 50-percent increase in membership. FEC’s upcoming Jose Marti Day of Service on March 2 will offer free food for all.